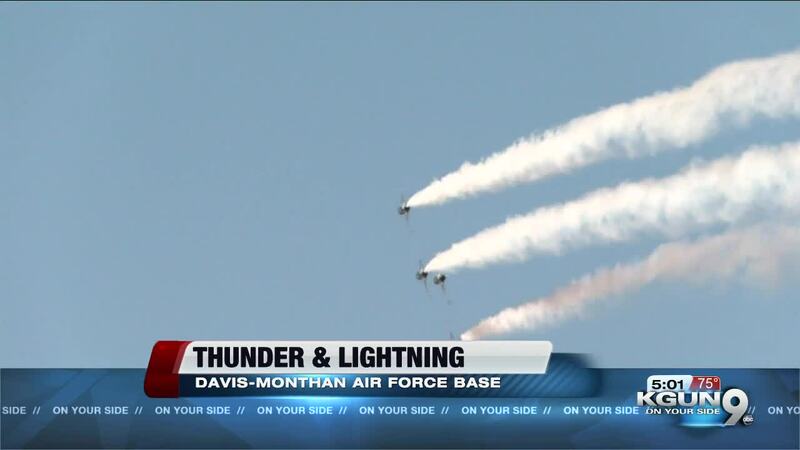 The Biggest public event in southern Arizona, The Thunder and Lighting air show kicked off this weekend at the Davis-Monthan Air Force base. TUCSON, Ariz. — The Biggest public event in southern Arizona, The Thunder and Lightning air show kicked off this weekend at the Davis-Monthan Air Force base. From kids to adults, pilots to veterans, the annual airshow brings hundreds of thousands of people together from all over the world in support of the Air Force and the Untied States armed forces. A son of an Air Force pilot himself, Skip Collins was a aircraft maintenance officer for more than 26 years. Traveling the world for his mission, Collins is now retired, he says the airshow is a way to stay connected with his brothers. “Admire the technology, see what we can do and appreciate the mission that they have to keep this country free,” Collins said. For the Collins family the tradition continued. After being inspired by a Thunderbird pilot in fourth grade, Skips son Major Whit Collins is now living his dream as the slot pilot for the U.S Air Force Demonstration Squadron, flying the Number 4 jet. “My wife and I love to watch him interact with school kids because he remembers being that kid and can relate to them.” “If you’ve set a goal you can achieve it." The airshow is also a way to step in to the past. For Amanda Bailey and her two boys, exploring the A10C Thunderbolt II, was another chance to learn about an aircraft that was in service in Desert Storm outside of the classroom. "When you learn something in school or see a video it's different than to actually see it in person,” said Bailey. Words of wisdom that Veteran pilot George Matais agrees with. "Flying an aircraft carrier is the one thing that no body else can feel if you do it,” Matais explained.